We are in the process of packing for an upcoming move, so I hope by the end of the weekend to have my "sewing studio" packed up and out of the dining area to make room for more boxes. 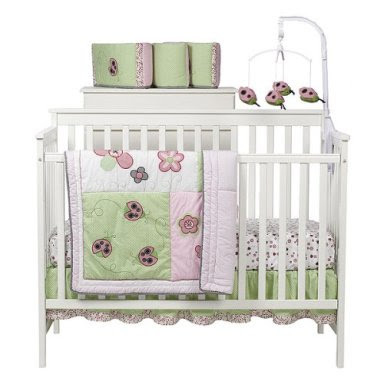 But before finishing my orders, I decided I needed to do something for Annaliese instead of waiting until after the move. I haven't stitched anything for her in two months, since the "I'm going to be a big sister" shirt... Thankfully Grandmama made her a twirl dress and Grandma sent three embroidered tops and matching skirts! 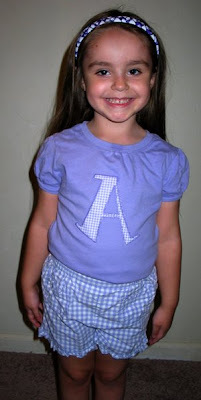 Kathy sent these shorts to Annaliese around her birthday, and later sent the matching shirt when I mentioned that I had a scrap of gingham fabric that would make a great applique patch. And recently Five Star Fonts released a new set, Wacky Wonky Applique Font, so yesterday afternoon I combined them all and got this outfit! I don't have a close-up of the applique design... Annaliese wanted to wear it immediately! Valerie has two good friends that recently gave birth. 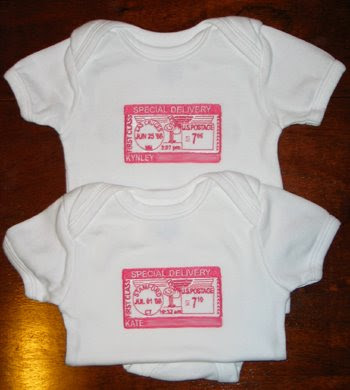 She asked for Special Delivery onesies for each little girl (design from Sew Terific). For the first burp cloth the applique is from a football sucker holder design from Embroidery Garden (a freebie on her yahoo group) and I added the text with Embird Alphabet #8. 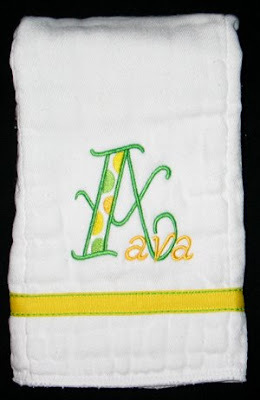 The second monogram is from the Dot Alphabet I originally got on Sew Forum (now available at Julia's Needle Designs), and the name was added with Five Star Font's Whimsy Alphabet. Cute huh? Thankfully my ribbon stash included the perfect ribbons. 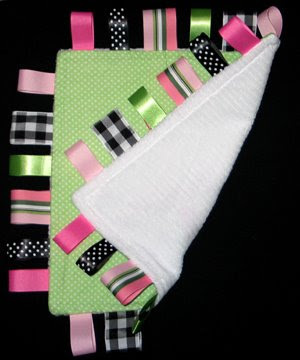 I bought some cute green polka dot flannel and made this ribbon blanket for her. 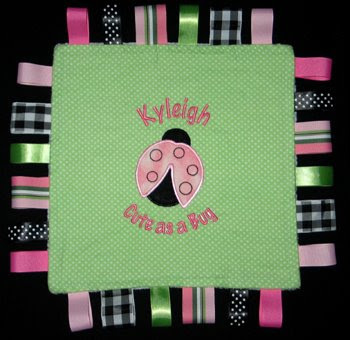 The applique ladybug is from Embroidery Garden and I added the text with Embird Alphabet #8. The back is white super-soft minkee. I LOVE how this turned out! 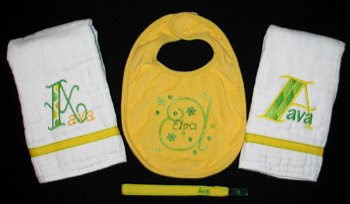 I can't wait to know the gender of our baby so I can make some for him/her! My First T-Shirt Quilt is DONE! 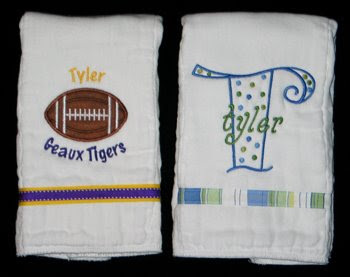 This is my first T-shirt quilt that I made for Carla and Blake. I'm very pleased with the results and anxious to deliver it to them. I'll give the whole saga below, but let's start with the pictures! 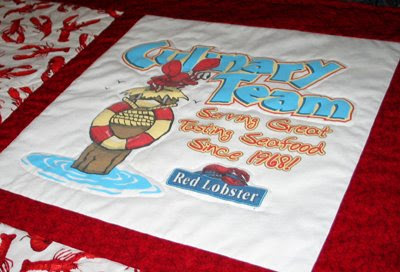 The front consists of five t-shirts and 4 blocks of lobster fabric. 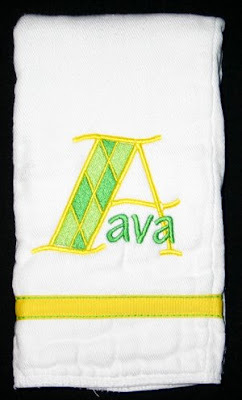 I used a fusible woven interfacing on the t-shirts. The primary reason is to stabilize them and make it easier to sew (less stretchy). What amazed Carlin and me was how much it brightened up the t-shirts. Four of the shirts had designs that filled the 15" square, but one did not. We decided to add embroidery to that shirt, not only to fill the space, but to document who it was for. 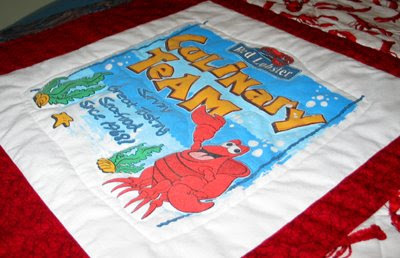 The back ended up having to be pieced because initially we didn't order enough fabric, and then we bought two different lobster prints to supplement our fabric. I just did a big nine-patch on the back. 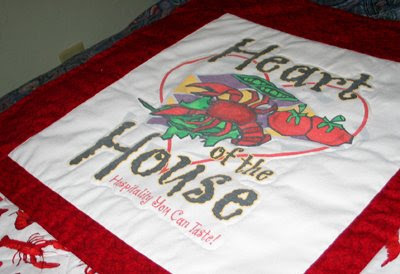 Over a year ago Carla asked me about making a T-shirt quilt. 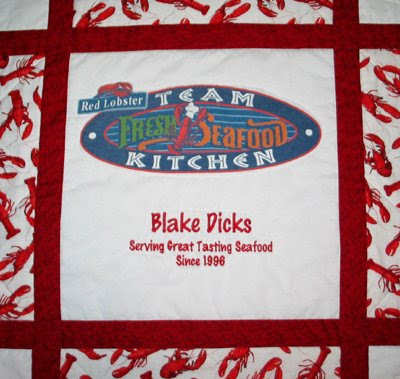 Blake is a store manager at Red Lobster, and during his tenure has received some T-shirts which he no longer wears. 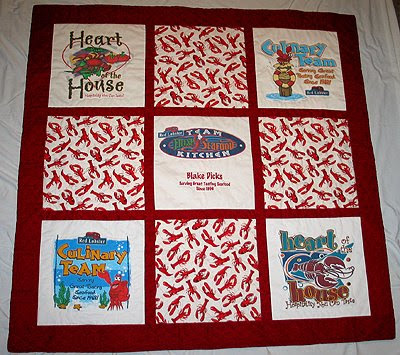 Carla has a T-shirt quilt that her grandmother made her a while back, which she loves, and wanted to do the same for Blake. I agreed to give it a shot. This was before I even knew I was getting an embroidery machine! Now when it got right down to it, it really didn't take an overwhelming amount of time to make. But it sure was a long-time in the making!! 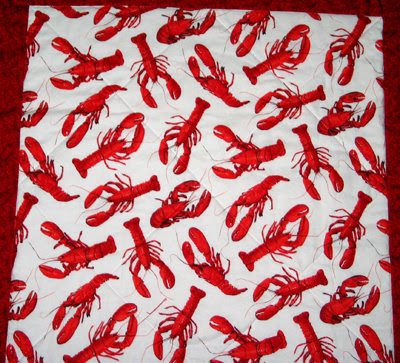 Last year in March we began looking for lobster fabric online. 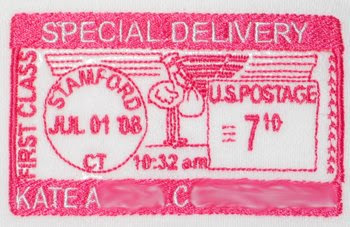 Mid-April I emailed Carla a couple quilt layout options. 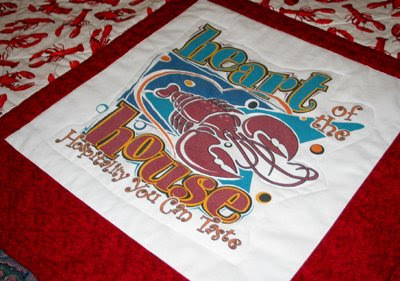 She picked one and we ordered the lobster fabric for the back. At some point before beginning Carla realized the dimensions of what she choose wasn't really as big as what she was hoping for, so we went with the other option. 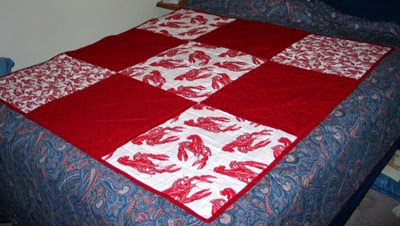 But making the front bigger meant the back would be bigger, so we no longer had enough lobster fabric. In June I found two different lobster prints as part of an estate sale, so we bought those, too. Now, in the midst of all of that I was working on a crib-sized quilt for her daughter Ella, as well as a ton of other embroidery projects. So I don't want it to sound like I totally put the quilt on hold... But in essence we did. We both started working at the preschool, which limited my sewing time and her ability to watch Annaliese while I sew (part of the payment process). Carla was very gracious in saying, "there is no rush" which was a blessing during the holidays. Fast forward to spring of this year. 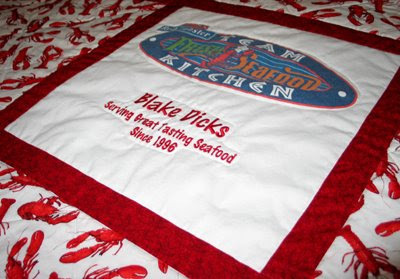 Carla asked if I could get the quilt done by Blake's birthday in June. At this point he would have completely forgotten the discussion and it would be a surprise. I said, "YES! I need a deadline or it will never get done!" And I had every intention of doing so. But notice today's date is JULY 11, not JUNE 11?? Well, as I've already blogged about, morning sickness hit me hard, and there was no way I was going to get it done. Carla is a dear friend, and if she was irritated by the delay, she did a great job hiding it from me! :) They have since moved away, but will be in town this weekend, and so Sunday night became my new target date. FINALLY. IT. IS. DONE. 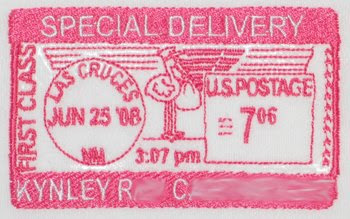 I'm very pleased to have completed this, and I now know that someday I can make one for myself with the millions of t-shirts I have collected in my 30+ years. But it's going to be a while. Maybe not until I have access to a long-arm quilting machine or can afford to pay someone to do that for me... mine will end up being a double-sided king sized quilt I imagine, and there's NO way I'm quilting that on a standard sized machine... even if my mom can. Ok, this post is long enough. Signing off! The onesie is a design I've wanted to stitch for quite a while. 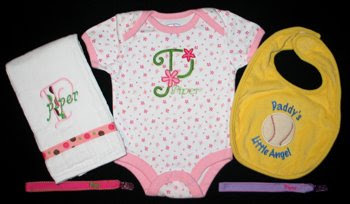 I was inspired by a post on Sew Forum that had used this monogram font on the floral onesie (of which I have several). I think it's a perfect fit! It's hard to tell from this picture, but there are green leaves among the flowers in the print. The Flower Power monogram was a freebie on SF (now available at Julia's Needle Designs). 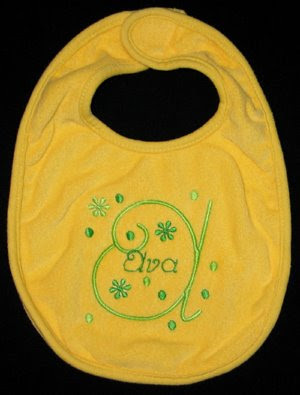 I added the name with the Rhumba font available at Sew Crazie Designs. 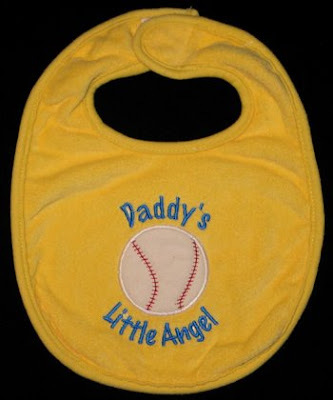 Piper's daddy is a baseball fan, so for the bib I used the applique from a baseball sucker holder design from Embroidery Garden (a freebie on her yahoo group) and I added the text with Embird Alphabet #8. No specific team affiliation given, so I just picked a cute yellow and blue. Only one post in June... wow. At least there were several orders within that post! In general I have been feeling better, but stress has increased here in the Trammel household, which has made my morning sickness kick back in. Oh, and I have been working on a quilt that I plan to have completed in a week. I haven't been posting about my progress on that, I'll just do one post at the end. 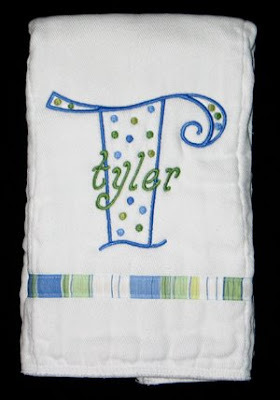 I monogrammed the first burp cloth with Five Star Font's Whismy Dots. 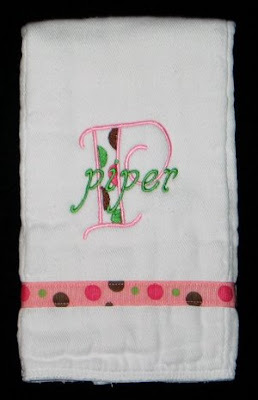 I monogrammed the second burp cloth with Lynnie Pinnie's Preppy Plaid Font. 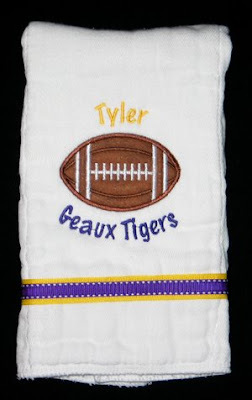 And for the bib, I monogrammed it with the Rhumba monogram set available on Judie's yahoo group Sew Crazie Designs.